Morse Watchmans has designed and developed Tour Pro to offer you extended functionality for your guard management system. This unique security guard management software allows you to download tour information, program the data recorder, generate custom reports and manage files using one simple program. It converts stored data from your officers’ tours into useful, detailed, printable reports. By choosing a fixed or variable set of criteria, you may customize the reports by time, day, week and month for numerous types of transactions. Tour Pro is engineered to integrate with a Morse Watchmans Guard Tour data recorder by a direct connection, modem or TCP/IP network connection. The upgrade to TCP/IP capabilities allows system managers to administer data recorders from multiple locations through an existing LAN (Local Area Network). We are the only company in the industry that designs, codes, and supports our own security guard tour software. This ensures total compatibility of the systems. TourPro Data Sorting Software is a Windows® application that gives you the power to download tour information, program the data recorder, generate custom reports and manage files from one simple guard management program. TourPro’s Quick Access window contains the four essential functions of the program. Just click on the function you want to perform…it’s that easy! Tour Pro converts stored data from the tours into useful, detailed, printable reports by time, day, week, and month. 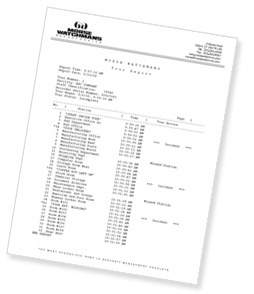 Exception Reports – prints all of the tour information including missed checkpoint stations. Incident Reports – tracks all incidents officers encounter. Summary Reports – displays an overview of the tours info based on particular sequences.